What color are the eggs in your fridge? 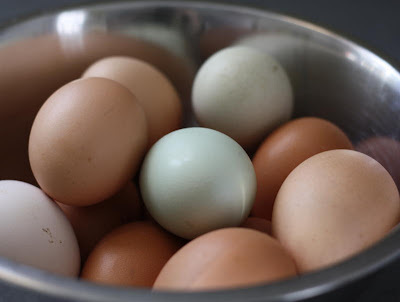 For information on why eggs have different colors head on over to this article at wisegeek.com. The color of chicken eggs should not influence your purchasing decisions at the market, as the contents of the egg are what counts. Chickens who eat free range, varied diets tend to produce healthier eggs, as their free range lifestyles allow them to consume the dietary minerals they need for their own health, and these minerals will be passed down in their eggs. You may also have noticed that farm-fresh eggs tend to have dark yolks, whereas chicken eggs from battery hens tend to have lighter yolks; this color is determined by what the hen eats. That said I still like the variety of colors these eggs bring to our fridge.